Want an international education but can't spend 2-4 years abroad? STEAM is designed for college students who are interested in enhancing their current academic experiences with a global perspective. Selected students will travel to one of our partner institutions to participate in a comprehensive international internship experience. The program consists of industry experience, professional development, relevant training, cultural exploration and the priceless opportunity to interact with peers at the host campus. The program is designed in such a way that it does not interfere with your current education and will provide you with a rich global perspective that employers today are seeking in their college graduates. Select your City: The first step is to decide which city you want to go to. Each city has its own areas of opportunities that you should consider while making a decision. 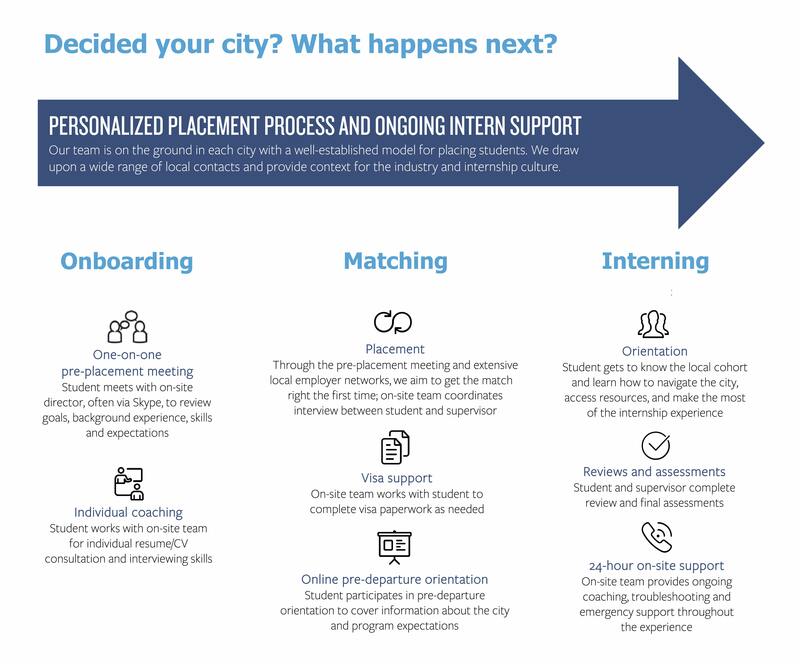 Preplacement Meeting: Once the city is decided, we will place each student in an internship that corresponds to the course of study, to ensure the quality and academic relevance of the placement. To determine the appropriate opportunity, the student receives an individual assessment meeting with the city director to clarify the student’s skills, interests and professional goals. The student’s cover letter and resume will be reviewed at this time. Matching: We draw upon our extensive employer network to find the right match. Our team will conduct vigorous outreach to locate a proper placement. The student and company will then conduct a formal interview. During the Internship: Once the student commences the internship, our team provides office hours for counseling beyond the standard workday, offers mid-term reviews to ensure learning goals are being met, and acquires the supervisor evaluation at the conclusion of the placement. Explore: Research the city of interest. Check with us for city specific opportunities. You’re just a few steps away from your next internship! 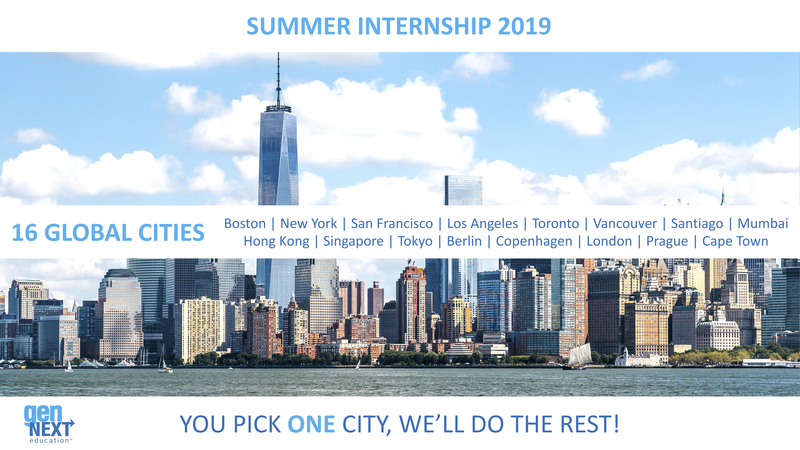 Summer internships are available at the following cities. Each city has multiple areas of opportunities from engineering to finance to arts and everything in between. We will try to find the best fit internship for you. Please ask us for what opportunities are available at your city of choice. READY TO ADD STEAM TO YOUR STUDY OPTIONS? To learn more, contact us at sheela@gennexteducation.com or ben@gennexteducation.com. Note: Applicants will be considered on a first-come, first-served basis.